Headlies: WWE Cruiserweights Give Enzo Amore A Christmas He'll Never Forget - WrestleCrap - The Very Worst of Pro Wrestling! Hackensack, NJ – WWE’s Cruiserweights celebrated the holiday season together much to the chagrin of current Cruiserweight champion Enzo Amore. The stars of 205 Live played in the snow, ice skated, and enjoyed each other’s company. It made Amore sad. Cedric Alexander noticed sad Amore staring out his window and had an idea. “Hey, gang! We should do something nice for Enzo,” said Alexander. “He’s all alone on Christmas and everyone deserves to be happy on Christmas!” said Noam Dar. “He’s on the second floor, that’s way to high up for me,” said Drew Gulak. “Come on, guys. I know something that will cheer Enzo right up!” said Kalisto. The group of Cruiserweights rang Amore’s doorbell. Amore opened the door, greeting the group with the loud sounds of late 90’s hip-hop and Axe body spray. “What do you dorks want? The champ is busy!” yelled Amore. “Merry Christmas!” shouted all the Cruiserweights. “Feliz Navidad!” said Lince Dorado as he gave Amore a lucha mask with a festive bow on top. “Happy whatever!” coughed The Brian Kendrick handing Amore a strange pencil holder. “Merry Christmas, old chap!” said Gentleman Jack Gallagher, giving Amore a brand new umbrella. Suddenly, Santa Claus came into Amore’s gaudy apartment. “Wait, you’re not Santa!” shouted Amore. He pulled Santa’s beard off to reveal that it was, in fact, former WWE star Ryback. “Merry Christmas!” shouted the Cruiserweights as they closed Amore’s apartment door amid the sound of breaking furniture and jingle bells. 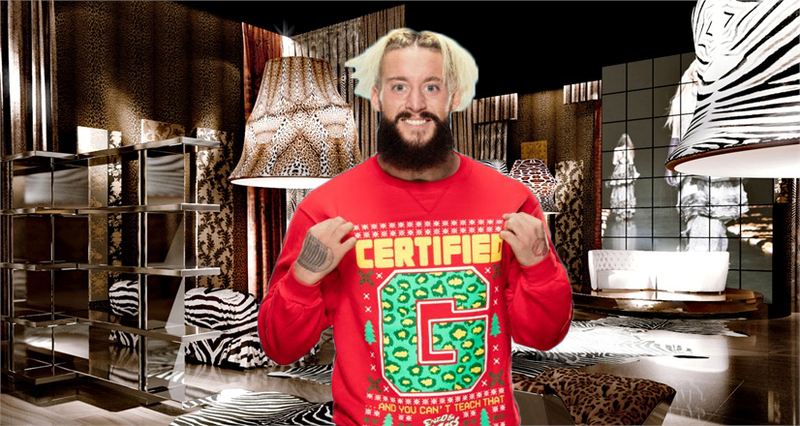 Headlies: Enzo Amore Is "Lost In Seaside Heights"
1 Response to "Headlies: WWE Cruiserweights Give Enzo Amore A Christmas He’ll Never Forget"
This makes me want a leopard print Christmas Tree with a leopard print stocking to hang near it with care and a special visit from Charlotte Flair and we’ll sit on near a fire on a leopard print chair. For poor Enzo that day wasn’t fair but at least he can beat Ryback when it comes to hair.